When I was trying to come up with a good appetizer for this year’s Thanksgiving spread, I thought about what dish I wanted to spice up, what ingredients I wanted to use and what I wanted to pass over. Last year, I decided to skip over the calorie-heavy favorite, the green bean casserole, in favor of other dishes. 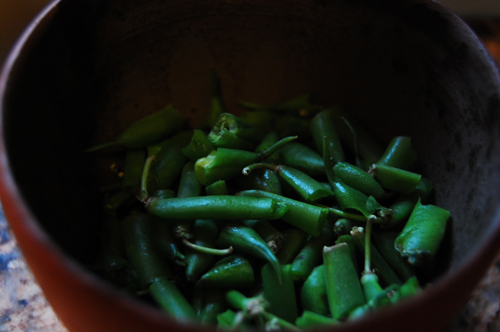 Instead, I made apple cider green beans, which I loved but were not a complete head over heels crowd pleaser. I thought about other holiday favorites, and realized everything I thought of had one thing in common- it was wrapped in bacon (or prosciutto). Perfect! Green beans roast well because they’re a very firm vegetable, and their flavor is strong enough to stand up against bacon. 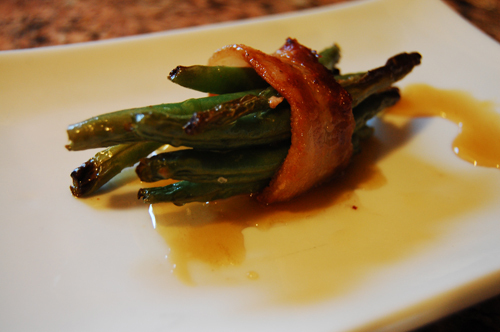 I decided to pair it with a glaze, something that would play well with the essence of bacon but also tie the dish in with the rest of the meal. Thanksgiving is, after all, about blending dishes. I prepared this side dish as part of a larger meal for Springpad’s 2009 Thanksgiving competition. Because of this, I wanted this dish to have notes of flavor in common with the other dishes in my spread. The marinade on my roasted mango and habanero turkey was roasted mango, roasted habanero, and orange juice. So I made a glaze for the green beans out of brown sugar and orange juice. The orange juice tied the flavors in with the turkey (and the cranberry sauce). I used sugar to thicken the glaze, brown sugar in particular because it’s richness compliments the bacon. The end result was scrumptious, leading Dan to suggest (not for the first time) that everything in life is better wrapped in bacon. 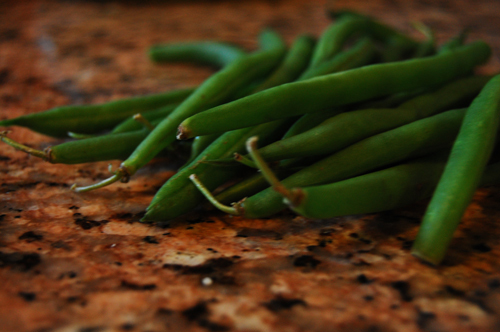 Snap the ends off of your green beans. Preheat your oven to 400. Cut each slice of bacon in half. 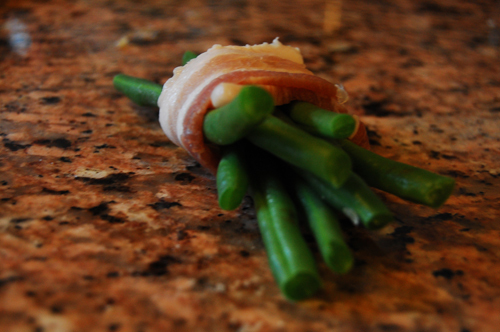 Bunch together 5 or 6 green beans, and wrap a piece of bacon around them. Secure with a tooth pick. Repeat until all the beans are wrapped. 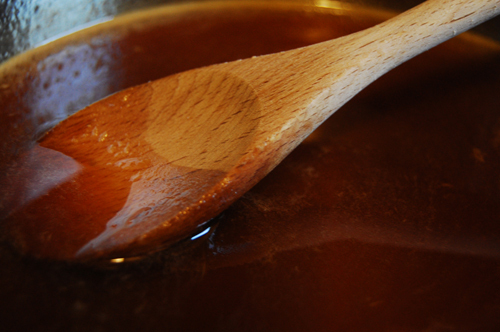 While the beans are in the oven, combine oj & brown sugar in a sauce pan. Bring to a boil. Remove from heat and cool. When the beans are done, plate them and drizzle with sauce.